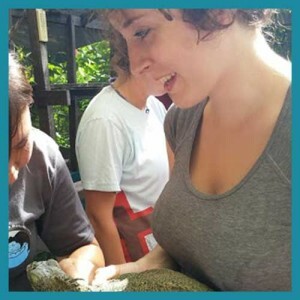 These are some of the great experiences students and interns had with the Belize Wildlife and Referral Clinic, the Wildlife Institute and our partners who work on the front lines of wildlife conservation in Belize and the region. Justin and Dr. Isabelle were so involved with my learning experience. The time I spent at the BWRC was invaluable, indescribable, and in every aspect, life changing. How could I even begin to describe my internship when words fall so short of my actual experience? The BWRC not only gave me an insight to veterinary medicine in a way that no other internship has given me, but also an indescribable feeling of camaraderie for which Belize now feels like my second home. Justin and Dr. Isabelle were so involved with my learning experience, making sure that I was absorbing every bit of information, answering all my questions, and having the time of my life. While other veterinary internships I’ve been involved with merely had me observe and standby, Dr. Isabelle and the BWRC had me truly be engaged with the entirety of the process. I was the one administering vaccinations, catching and handling the animals, doing the x-rays, overlooking anesthesia, sitting on a crocodile during surgery, and so much more. It was the most hands on I could have been as an intern, with their guidance and patience leading me in any direction I chose to go. Of course, being within the field of wildlife, the days are unpredictable where you don’t know how the day will go or what you’ll get. However, at the end of the day, I feel as though that’s the best part of the experience, that’s what makes it so real. One day you could be getting only domestic cases, but the next you have an emergency howler monkey coming in or boa constrictor or even a manatee. The stochastic nature of working with wildlife and especially working with wildlife in a developing country calls for ingenuity, strength, patience, and heart. All of which I’ve seen and experienced working with everyone at the BWRC. It was never, “hey this is too chaotic for you to be here” but more so “how can we as a team work together to save this animal, solve this problem, build this better?” It was the most real and involved situation I could have been in, and for which I have utilized the knowledge I’ve gained from working at the BWRC over and over again. The BWRC felt more like my family than just an organization. They were involved with my academic, career, and personal growth, and still are part of my life today. I honestly don’t know how the direction of my life would have gone if I hadn’t worked at the BWRC, and I am so eternally grateful to have been with them. All I’ve seen since my time there is improvement and growth, and for anyone presented with the opportunity to work with them, I give my highest recommendation to do so. Dr. Isabelle and Justin were kind enough to facilitate a personalized clinical rotation for me and four other classmates from Michigan State. Rather than spending 3 weeks at Belize Wildlife Referral Clinic, we were invited to complete the first 1-2 weeks at ARCAS in Guatemala. As someone who has visited Belize a handful of times but never had an opportunity to cross the border into Guatemala, I was thrilled with the idea of a new adventure. On the other hand, we had no clue what to expect. ARCAS had never hosted veterinary students for a clinical rotation before. We would usually have a lecture with Dr. Alejandro and / or Dr. Fernando each afternoon and participated in treatment of hospitalized animals. Some days, we would plan an enclosure-wide capture of animals to perform physicals, get blood samples, and give dewormer / ivermectin as needed. Daily life at ARCAS was quite rugged. We slept in a screened bunkhouse, ate meals with the crew in the commissary, and completed daily chores. These chores always included preparing diets and cleaning enclosures; manual labor was thrown in at random. This new lifestyle hit us like a ton of bricks and we experienced emotional ups and downs. The harder we worked, the more involved our clinical experience became. The development of camaraderie, trust, and respect was like nothing I had ever experienced. Dr. Alejandro and Dr. Fernando tailored to our individual interests and surpassed our expectations. ARCAS houses hundreds of animals and the doctors exposed us to all kinds of species, building our confidence in wild animal restraint & medication delivery through various routes. The doctors at ARCAS are wonderful, brilliant people that went above and beyond in providing us with a life-changing experience. We spent the latter end of our rotation at Belize Wildlife Referral Clinic in a more intimate, organized setting. Dr. Isabelle aimed to provide lessons to suit each of our individual interests. We even spent one morning touring the slaughterhouse next door upon my request, the future cow vet. I learned a few tricks and technical skills that have come in handy with exotics on other rotations. The entire experience between the two facilities was a perfect way to explore different forms of wildlife medicine. It was also a fantastic adventure and I would do it again in a heartbeat. I never felt like an outsider, I was simply part of the team the moment I arrived! Greetings from the University of Tennessee College of Veterinary Medicine! My name is Wendy Parker and I am a member of the UTCVM class of 2018. I have participated in the Wildlife Institute’s wildlife medicine and conservation course in the winter of 2015/2016. I was fortunate to receive 2 credit hours for this course at UT and as of next winter (winter 2016/2017), UTCVM will be offering the Wildlife Institutes course as a registered course for all UTCVM students. As an avid travel and (Obviously) someone who loves animals, I knew that I would want to spend all of free time both traveling and working with animals, so I took to the Internet searching for something that could meet my needs. I have never been afraid to try new things, and so once the Belize Wildlife and Referral Clinic showed up in my search results, I was hooked. I knew taking on this opportunity would mean that I would be going to be spending time with other students I had never met. This can be a little scary, but I love to meet knew people and knew this would be a great opportunity. This course was better than I could have ever imagined. 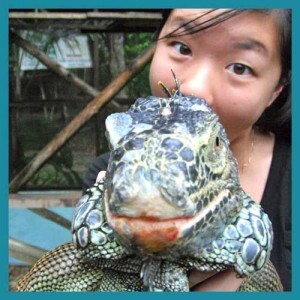 Not only did I get to work with many different species, it also gave me opportunities to travel and learn both about veterinary medicine and Belize as a country. For those who may not speak any other languages, this is the perfect course for you because Belize is a country that already speaks English. I know for some of my other fellow vet students that were there, that was comforting for them knowing that. Any nervousness I had about being with 9 other girls I’ve never met was washed away that first night we spent in Belize. All the girls were wonderful people and the staff and helpers for BWRC were welcoming and kind. I never felt like an outsider, I was simply part of the team the moment I arrived! Dr. Isabelle has a great outlook on life that I think many veterinary students would benefit from experiencing and listening to. I would be more than happy to speak with anyone in regards to the trip and its authenticity. I want to thank BWRC for having me, and I hope to return soon! 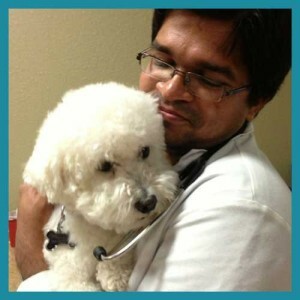 My experience was one of the main reasons I am now in veterinary school. The Belize Wildlife and Referral Clinic (BWRC) was one of my first international veterinary experiences as an undergraduate student. Dr. Isabelle, Justin and everyone that worked at the clinic during my time there were truly inspirational. I was able to learn about veterinary medicine in domestic and wildlife animals while experiencing a different culture than my own. The BWRC opened my eyes to the human, animal and environmental interface, known as One Health, in a developing country. My experience was one of the main reasons I am now in veterinary school and have a passion for One Health and international travel. I am extremely grateful for the BWRC and the knowledge it gave me to pursue my own dream. I look forward to working with Dr. Isabelle and the clinic in my future. 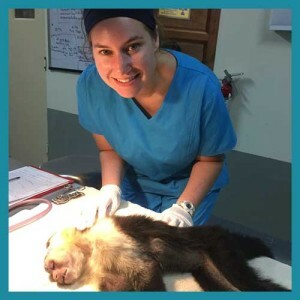 I am Claire, a French vet student that came to the Belize Wildlife Clinic last summer in order to improve my knowledge about wildlife care. I have been there with a friend without knowing what we would do exactly because I like being surprised and, indeed, I was not disappointed at all. It was not only a great experience but it brought me a vision of what I would like to do in the future as a vet. We learned about birds and reptiles, animals that we do not study in class, and it was very interesting. We visited several conservation programs that are keeping the Belizean wildlife alive. We also had the opportunity to go to Guatemala and we learned there about the rehabilitation of howler and spider monkeys. Moreover, we had some free days organised so that we could discover the wonders of the region and we visited the Mayan temples of Tikal in Guatemala and went snorkeling in the Cayes of Belize. It would take me many days if I described everything that we did and my feelings about it so I will go straight to the point : It was a wonderful experience that combines visits of a beautiful country, unusual vet experiences and social interactions with very interesting people. I gained experiences that would never have been possible in the United States. The month I spent in Belize was one of the most inspirational and fulfilling months of my life. I started out doing the Wildlife and Conservation Course and stayed for an internship of an additional two weeks. As a pre-veterinary student, I did not expect to do as much as I did, especially when there were veterinary students in my program with a year of vet school under their belts. I got to learn and participate in everything the vet students were doing, and that was something that really made this experience worthwhile. During the course, I handled and helped medicate animals I had never gotten to work with before, such as iguanas, kinkajous, foxes, and even a boa constrictor. I was lucky enough to also help with the surgery of a baby howler monkey’s tail! During our visit to Guatemala, I also got to restrain and medicate scarlet macaws, some of the country’s most endangered species. This was the opportunity of a lifetime. In a country full of beautiful wildlife and its own conservation challenges, I learned about what there is to do and what future veterinarians can help with. Dr. Isabelle herself has an amazing and inspiring story. Her passion for her patients and her job is contagious, and it was an honor to work under her guidance. She and my participation in this program helped cement my interest in wildlife medicine and strengthened my focus on conservation. I wish my internship lasted longer, because every day felt like a new learning experience packed with new animals and new medical cases. While the course provided daily lectures and activities, the internship allowed more observation and assistance in day to day clinic work – something I was eager to help with. The interns helped with a mixture of domestic animals as well as any wildlife emergencies that came in. This way, I learned how to take and read x-rays, practiced taking a pulse on a variety of animals (including a crocodile! ), cared for a variety of animals, and exercised a snake! I even was taken on a special trip outside of the clinic to work with scarlet macaws again, which I loved. All in all, I fell in love with Belize and the incredible wildlife that inhabits it. I made lifelong friends in my 4 weeks there and gained experiences that would never have been possible in the United States. I feel so grateful to have gotten this opportunity! For more details on what I did during my time at BWRC, check out the blog posts I wrote during my time there. This is exactly where I am supposed to be! 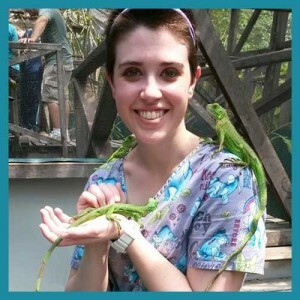 I am Tammy Tate, a veterinary assistant at the Belize Wildlife and Referral Clinic (BWRC). I have been working with the clinic since August 2014. 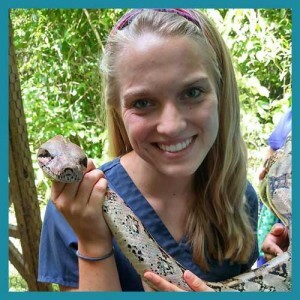 I grew up in southern Belize and have known for a while that I wanted to work in veterinary medicine. After finishing college and realizing that vet school would not be immediate, I googled “veterinary medicine in Belize.” It led me to BWRC. The clinic is relatively new and growing. Currently, I am the only full time employee, so my duties as assistant stretch far and wide. In just about every step our patients undergo, I am involved from retrieval/reception to emergency care to surgery to hospitalization to rehab and release to reporting and filing; all while trying to keep everything clean along the way. This position is very diverse and most days I am utterly spent. I provide care to poached and scared babies who long for their mothers, and help nurse the injured back to health. In the moment they are released back into the wild, I know, in the timeline of my veterinary journey, this is exactly where I am supposed to be. ..from meeting and treating weird and wonderful wildlife, to providing excellent care..
this is the best, most unique hands-on experience available for wildlife, animal science, and pre-vet students. I was lucky enough to know Dr. Isabelle and Justin before the clinic opened. Their family had already established themselves as an important part of the Cayo community in Belize. 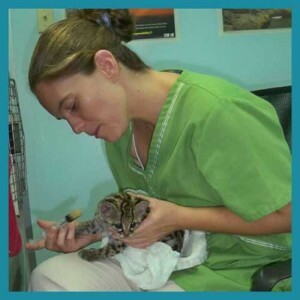 Then, Isabelle won the Heska Grant to open Belize’s first Wildlife and Referral Clinic. Isabelle was invited to visit New Mexico State University (NMSU) as a Gerald Thomas Fellow for a week’s worth of seminars and presentation on campus and for the community. After each of her presentations, she had a group of excited students wanting to talk to her about internships and opportunities to work alongside her. I was thrilled to see some of my NMSU Belize Field School students get accepted to interns at her new clinic. I was also excited to see my good friend – the talented, devoted, Dr. Isabelle – be recognized and supported. From the first day the clinic opened, it was full steam ahead helping domestic and wild animals recover from injury and training young vets to take on the challenging work. One of the most compelling clinics with dozens of stories to pull at your heartstrings – this clinic is the one of a kind. Inviting international professional med-vets and interns, this is the best, most unique hands-on experience available for wildlife, animal science, and pre-vet students. Without hesitation, I recommend that university faculty and administrators send their talented students to participate in this life-changing experience. It is a great place for any pre-vet or veterinary students to hone their skills in wildlife medicine and conservation. I wanted to say how awesome is Belize Wildlife & Referral clinic and its partner non-profit organization Wildlife institute, based on my experience for 30 days of working as a volunteer veterinarian with them. I have been passionate about travelling from childhood and always wanted to spend my time off as work-cation in different parts of the world. I am fortunate enough to be a veterinarian and getting chance to work with Dr.Isabelle and Justin in Belize. Both of them have been working hard for noble cause – treating wildlife and abandoned animals in Belize by partnering with several local rescue and educational groups from all over the world. I learned a lot about wildlife medicine from Dr. Isabelle. 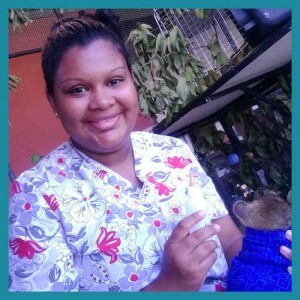 She is truly a passionate veterinarian, working hard by educating students and public for ecosystem balance, rescuing and treating several wildlife species that are at the verge of extinction in some parts of Central America. She was very helpful and knowledgeable about common problems seen in wildlife and developing better treatment protocols to save their lives. Justin, is a knowledge mine (Like a gold mine) and very inspiring human being that I have met in my life! His travelling adventures are so inspiring and thoughtful about life. Very passionate about doing something different that benefits society and future generations. He is genuinely interested towards teaching students and empowering them. Learned a lot about Guatemala conservation projects from him while visiting ARCAS. 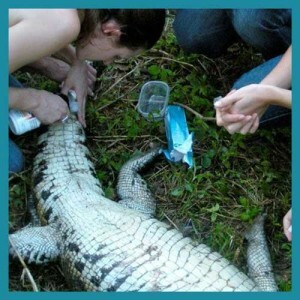 It is a great place for any pre-vet or veterinary students to hone their skills in wildlife medicine and conservation. Based on my experiences, I am very confident to say that it will be a wonderful experience for anyone willing to learn and do something different. I recommend and commend Belize Wildlife and Referral Clinic for their dedication and compassion for saving lives of these special, intelligent and social creatures. I enjoyed my time in Belize so much that upon graduation from veterinary school, I returned to Belize to work at BWRC! During my clinical year of veterinary school, I was fortunate to be able to participate in the 2 week internship program working with Dr. Isabelle. During my time in Belize, I was able to gain experience working with a large variety of wildlife including many species of birds, primates, reptiles, small felids as well as exotic pets and domestic animals. I enjoyed my time in Belize so much that upon graduation from veterinary school, I returned to Belize to work at the Belize Wildlife and Referral Clinic with Dr. Isabelle. Dr. Isabelle is an amazing mentor and teacher. She helped me develop not only my medical and surgical skills, but also provided me with the confidence to step out of my comfort zone and take on many new challenges. Besides the many unique opportunities to work with a variety of wildlife and wildlife organizations, Belize is a safe and fun place to visit. There is always a lot to do and see, from the Mayan ruins, to the beach, to the Caves, and so much more. There is never a dull moment. And, the food is amazing! 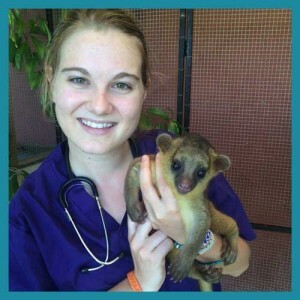 No matter whether you are a pre-vet student, a veterinary student, zoology or animal science major, or just have an interest in animals and conservation medicine, Dr. Isabelle and her husband Justin and the team at the Belize Wildlife and Referral Clinic will make sure that you have an amazing experience by learning a ton and making unforgettable memories! I certainly cherish my time there and hope to return again in the future. It was a unique combination of veterinary medicine and conservation work. Last summer (2015) I had the honor to stay in Belize for about 2 months as an intern/TA for BWRC and the Wildlife Institute, and I also participated in the Scarlet Macaw Guardian Program. It was a unique combination of veterinary medicine and conservation work, with adventure and fun thrown in as well! The BWRC was amazing being able to work with species such as crocodiles, kinkajous, and howler monkeys to domestic dogs and cats. I learned so much from Dr. Isabelle. 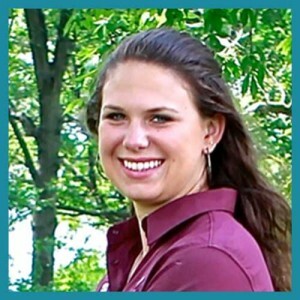 Not only is she an outstanding wildlife vet, but she also is an orthopedic surgeon! It was such a privilege working on a few such surgeries with her. I learned skills that I needed to use during my third year surgery program in veterinary school as well. As for the Scarlet Macaw Guardian Program, words cannot describe how wonderful that experience was. I will never forget the trip down the river with beautiful jungle on either side of the banks and stunning (and very loud) Scarlet Macaws flying free. I had only ever seen them in zoos or pet shops before, but this is where they truly belong. My part in this story was to help raise chicks that had been in the most at-risk nests for poaching. I am so happy that the chicks I helped feed and care for have now been released and are flying free! We also had the opportunity to help with field work, performing exams on all chicks and taking samples for research purposes. I met so many great wildlife and conservation heroes on this trip, from Dr. Isabelle to Boris of FCD, and Dr. LoraKim. They have to fight so many battles, and they deserve all the support we can give. I will never forget my time in Belize and the life-long friends I made. I hope I can come back someday! It is engaging, thought-provoking and brimming with new experiences! My first exposure to the Belize Wildlife and Referral Clinic (BWRC) was as a first year veterinary student. 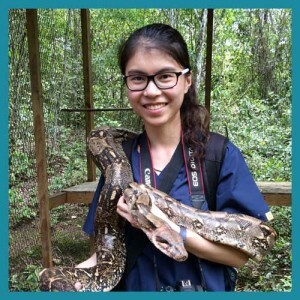 I have always had an interest in both wildlife medicine and international work, and the BWRC offered an opportunity for me to experience these together for the first time. I’ve never looked back. My time at the BWRC first as a student and then as a teaching assistant changed my life, personally and professionally. Not only did I learn about the care and management of wild animals I had never even seen before, but I also learned about the benefits and challenges of working in a developing country. Dr. Isabelle and Justin have put together a well-rounded program that does a fantastic job of incorporating the important aspects of caring for wildlife in Central America. It is engaging, thought-provoking and brimming with new experiences, and I highly recommend it to anyone interested in the field. Where once there was no hope, there now is! I have worked with Dr. Isabelle Paquet-Durand since 2011 in several different capacities, including working with wild parrots in Belize. For the field seasons of 2013 and 2015 I journeyed with her and her interns into the area where a collaboratory group is protecting and studying free flying macaws. I assisted them in learning how to conduct nest and health checks, and taking and processing laboratory samples for disease and genetic screening. They now regularly monitor the health of wild chicks, both those still in the nest and also temporarily in captivity awaiting release. Their dedication has served the scarlet macaw well, as well as the partner organizations with whom they work .The macaws are more fully protected, and their health maintained so that they can flourish in the wild. Where once there was no hope, there now is. By working with the Scarlet Macaw Protection Program you will not only gain experience in conservation medicine and parrot conservation, but you will also be part of meaningful work with an enthusiastic group of people where you will make a difference. My time at BWRC was a truly eye-opening, and even life-changing experience. My time at BWRC was a truly eye-opening, and even life-changing experience. 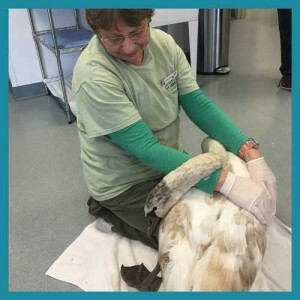 The first time I was standing at the front door at BWRC, I only had the vaguest idea about working with wildlife, and was here only hoping I could get some veterinary experience. BWRC gave me a lot more than what I had expected. Walking out of BWRC, now I not only know a lot more about veterinary medicine, but also have met many amazing people working in different fields, who I have the honor to call them friends. BWRC attracts me not only because of the variety of the patients we treated everyday, which ranged from reptiles to mammals and even birds, but more importantly, the persistence and passion of Dr. Isabelle has for her work make me love this place even more. It is almost hard to believe despite all the difficulties, she has been able to keep her belief and now is spreading it all around the world. After talking to and working with her, I believe that wildlife veterinary medicine and conservation are truly what I want to do for the rest of my life. I am also glad that BWRC brings me to this wonderful country, where nature is still the dominant. No matter how many ecology classes I have taken at school, it can never compare to what I felt when I was physically in the jungles. I found that the nature I have always loved was more beautiful than I imagined, and it made me believe all we have done and will do are meaningful. Words cannot describe how much I thank Dr. Isabelle and Justin for your help, both professionally and personally. I am still on my journey to achieve my goal, but I will always carry my memory of Belize with me. Interning at BWRC jump-started my veterinary career and I cannot wait to return! The BWRC experience provided so much exposure to wildlife veterinary medicine and conservation issues that I could not have received otherwise. 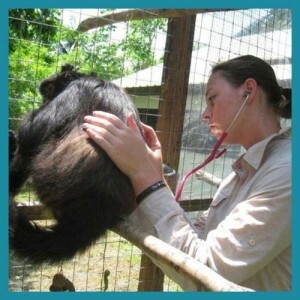 I worked directly with Dr. Isabelle treating a multitude of animals from snakes and parrots to horses and monkeys! Interning at BWRC jump-started my veterinary career and I cannot wait to return! The Wildlife Institute has provided much needed financial assistance to the scarlet macaw management project. 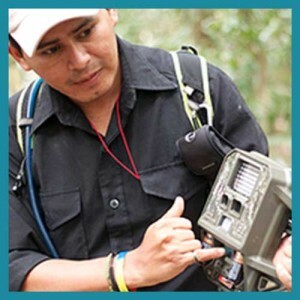 Wildlife conservation is a challenging endeavour but working with partners that share the same passion for biodiversity conservation, such as the Belize Wildlife and Referral Clinic (BWRC) and the Wildlife Institute (WI) makes the venture easier. Over the last three years the BWRC has been instrumental in the conservation and management of the endangered Scarlet Macaw population of Belize. The BWRC has provided free veterinary care for scarlet macaw chicks and has helped leverage funds for the project. The Wildlife Institute has provided much needed financial assistance to the scarlet macaw management project by recruiting professional volunteers who help in the laboratory hand rearing and husbandry of at risk of being poached scarlet macaw chicks. I am certain that without the help from these two institutions it would have been almost impossible to increase the number of scarlet macaw fledgling from 8 in 201 to a total of 15 fledglings in 2015. Although I was only there for a matter of days, I felt as though I was part of the community. I took part in the Wildlife Medicine and Conservation Course with the Belize Wildlife and Referral Clinic following my first year of vet school. I was able to see and experience the treatment of wildlife, try new medical techniques, learn a lot about conservation in the face of human animal conflict and work with some truly inspiring individuals. Justin met me and the other students at the airport and shuttled us directly to lunch and then to our housing for the next 10 days. This set the tone for the ease of transportation and housing of the course. We were driven everywhere that we needed to go and were housed at the cutest compound where we had apartments and locally prepared breakfasts every morning. The compound was within walking distance to downtown San Ignacio where we got dinner every night that we were in town. The course coordinators were more than happy to suggest great local restaurants. During the course, many of the days were spent at the BWRC. 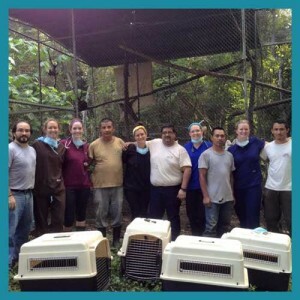 Here we were able to help with treatments of hospitalized animals and visit rehabilitating animals in the reserve where they are prepared for release. We were able to conduct several necropsies, discuss many past cases, and review parasitology, radiology, anesthesia calculations, and wildlife disease. There were also many trips within the course that allowed us to see many parts of this beautiful country. We visited the Belize Zoo where we learned about the importance of community education in regards to the value and importance of indigenous species. We toured the Community Baboon Sanctuary where they have implemented a unique conservation strategy- utilizing the community to preserve crucial Howler Monkey habitat. We also helped bathe iguanas at the Belize Iguana Project in order to treat and prevent bacterial, fungal or parasitic growth. Our class was fortunate enough to take a trip to Wildtracks, a manatee and primate rehabilitation center, and help with the capture and relocation of two white tailed deer. Here we were able to learn about and experience the veterinary principles associated with wildlife relocation and treat a Manatee with a pneumothorax. We were also able to experience Sarteneja and received an excellent lion fish dinner. The last day of the trip we were able to visit the Caye Caulker. We spent the day sunbathing and snorkeling around the island. It was the perfect ending to a perfect trip. I have so many great experiences and stories from my trip to Belize with the Wildlife and Conservation Course. I learned a lot about veterinary medicine, conservation, and human-animal conflict in the third world. The people and animals that I was honored enough to meet during this trip were so kind and helpful and inspiring that I would not hesitate to return. Although I was only there for a matter of days, I felt as though I was part of the community. I ate the best stewed chicken with beans and rice or rice and beans (which are different dishes), still crave the fresh lime juice, and remain in awe of the people that do so much for these animals with so little help. So go. Make your own wonderful memories and stories. When else will you ride of a boat with an anesthetized deer, bathe iguanas, treat a manatee, meet a baby kinkajou, watch the retired residents of San Ignacio attempt to Wobble, and be immersed in a new culture? Of course every experience is a little different, these are wild animals after all. Any student or intern who gets an opportunity to work with Dr. Isabelle and the BWRC will definitely have an unforgettable experience! My collaboration with Dr. Isabelle and the BWRC for the last several years has been a wonderful and exciting experience, particularly exploring and contributing vital data and ideas to the field of crocodilian parasitology, which is still in its infancy. 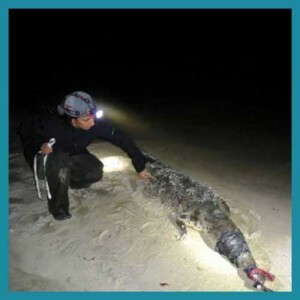 Given Dr. Isabelle’s innovative and professional work ethic in relation to crocodilian veterinary practices, I have nominated and identified her as one of the principal crocodilian veterinarians in Central America by the IUCN/SSC-Crocodile Specialist Group’s Veterinary Science Group. Any student or intern who gets an opportunity to work with Dr. Isabelle and the BWRC will definitely have an unforgettable experience that will give them a strong foundation in the field of wildlife veterinary science with a true leader in the field. The animals that I got to work with were unlike anything I have ever experienced. My time at BWRC was truly unforgettable. The animals that I got to work with were unlike anything I have ever experienced. 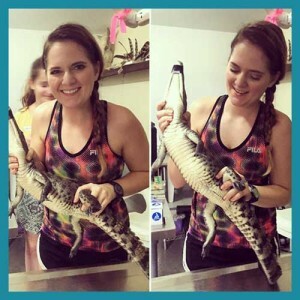 From tubing a red tail boa constrictor to performing surgery on crocodiles, my whole externship at BWRC was very hands-on. I was able to put into practice skills that I learned in veterinary school. I am extremely grateful to Dr. Isabelle for the support, encouragement, and advice that she provided me during my time in Belize. Her passion for wildlife conservation is truly remarkable! Justin and the entire staff at the clinic were tremendously helpful and made me feel like part of the family. I could not have asked for a better place to do my externship, and I would highly recommend spending time at BWRC! The clinic, with its many opportunities both on and off site, was an excellent educational experience. February of 2015 found me returning to Belize to visit Dr Isabelle, and Justin Ford at the Belize Wildlife Referral Clinic. Since my previous visit to Belize one year earlier, I had just passed my International Wildlife Certification exam. I had met Isabelle and Justin in 2014 while I was volunteering at Wildtracks. I was so impressed with their knowledge and compassion for all the wildlife of Belize that I knew the next visit was going to be to their clinic. When my husband Keith and I arrived, the clinic was extremely busy caring for a variety of newly injured and recuperating wildlife patients. Dr Isabelle was out with two other volunteer vets darting and capturing a juvenile howler monkey that was then sent to Wildtracks. 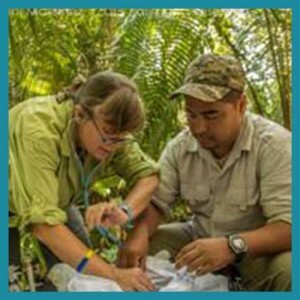 Dr Isabelle is the only fulltime wildlife vet in Belize and she covers the entire country. Her clinic is the only facility with radiology, ultrasound, and more advanced surgical equipment. The clinic set up impressed me as much as Dr. Isabelle did. The clinic staff graciously welcomed our help and assigned us patients. I took care of a 6-7 foot boa named Margo. She had been run over by a bushwhacker a few months back and was all busted up. She was doing much better so I carried her outside to lie in the sun and got her to move around to get some exercise. I syringe fed strawberry yogurt to a four eyed baby opossum named Piccolo who had an injured nose. So adorable. A very frightened juvenile raccoon was just admitted and was too stressed to be handled so I just fed and cleaned his enclosure with him in it. He later calmed down nicely. Feeder mice and rats needed some attention and cleaning. Every animal no matter what their purpose gets treated with compassion and dignity. Another patient, a green iguana named stargazer, had been brought over from the Iguana Project. He had been injured by another male lizard and was a little neurologic. I was assessing his ability to walk and climb. Three red slider turtles that are not indigenous to this environment were at the clinic to be sterilized surgically and then released. They are a byproduct of the pet trade. When people tire of them they just release them, and if not captured and sterilized or euthanized they will compete with the indigenous species for food and territory. Another turtle, an endangered Hicatee was there for treatment and to put on weight. Working with an endangered species is always a privilege, and it was extra special because this was my first Hicatee. At the end of the day we traveled off site to feed two coatis, Clarence and Lola. Whey were in a large enclosure in a secluded, wooded area to help them get ready for their release. The clinic with its many opportunities both on and off site was an excellent educational experience. Although the native wildlife species I work with on Cape Cod, Massachusetts are very different from those in Belize; the basic principles of animal care are the same. Working with Dr. Isabelle and her staff sent me on my way with new skills, new experiences to draw from, and new friends. Thank you for all you do. My Belize adventure was by far one of the greatest two weeks I have ever experienced! 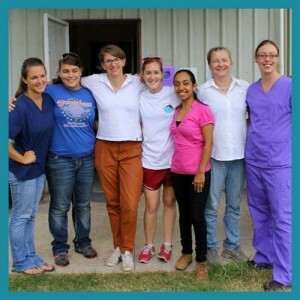 I interned with the Belize Wildlife & Referral Clinic for two weeks in April of 2015. The clinic is an amazing place with an absolutely brilliant staff. I found out about the clinic through a post on Facebook, and I decided to email the link provided where I received a response the same day. They were readily available and extremely helpful, making it easy to apply and join their next course. As a pre-veterinary student, Dr. Isabelle and the rest of the team welcomed me into a course where I learned so much that will greatly benefit my future. 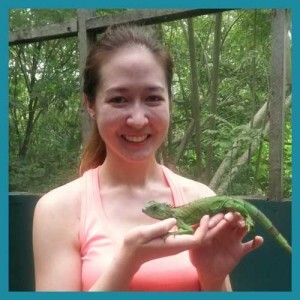 From hand-feeding a baby kinkajou and giving daily meds to iguanas to assisting in a surgery for a howler monkey, I learned and practiced valuable techniques with beautiful animals found in this magnificent area of the world. Every member of the team was enthusiastic and truly wanted to help me learn. Our group was able to also travel to ARCAS in Guatemala where, among other animals, we worked with scarlet macaws, and we also visited the Belize Zoo where we experienced an encounter with one their famous jaguars named Buddy. My Belize adventure was by far one of the greatest two weeks I have ever experienced, and I am so grateful to the staff for being so welcoming and teaching me so much.